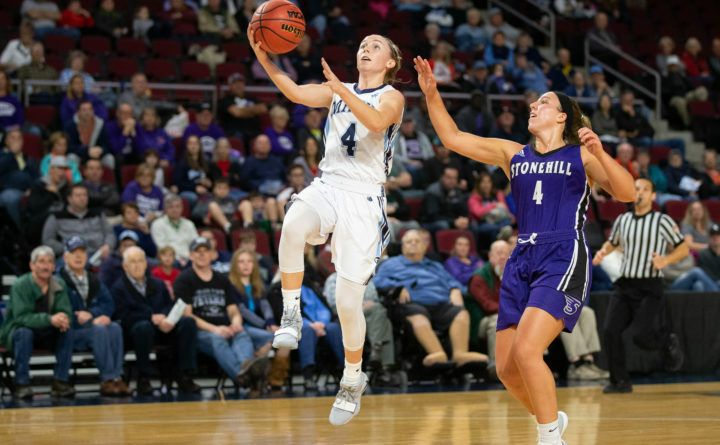 Blanca Millan connected for a game-high 30 points and the University of Maine shot 50 percent from the field on Saturday afternoon to register an 85-46 women’s basketball victory over Division II Stonehill College at the Cross Insurance Center in Bangor. Millan, a junior guard from Spain, went 11-for-31 from the field, including 5-for-9 from the 3-point arc and registered six rebounds, six steals and two assists to lead the Black Bears. Sophomore guard Dor Saar made five 3-pointers on her way to 17 points and handed out seven assists to go with three steals for the winners. UMaine shot 12 of 26 (46 percent) from long range in the contest. Senior guard Tanesha Sutton (6 rebounds, 3 assists) and junior guard Maddy McVicar (2 assists) netted 13 points each. Kayla Raymond and Maty Diabate paced Stonehill of the Northeast 10 Conference with eight and seven points, respectively. The Skyhawks finished the day shooting 36 percent (20-for-55) and committed 21 turnovers that the Black Bears turned into 31 points. UMaine built a 21-11 lead after one period and extended it to 40-21 at halftime. The Black Bears then manufactured a 36-14 third-quarter advantage to put the game well out of reach.